June 2013 - I'm extremely pleased to announce the release of a new book on which I have heavily collaborated, written by Dr. Jim Rieuwerts, the leading British historian of Derbyshire lead-mining, and which has recently received a citation in the 2013 Tratman Award given for excellence in underground publishing. Titled Adventurers in the Lead Trade (ISBN: 978-0-9563473-5-0), and commissioned by the Davie-Thornhill Estate of Stanton Hall in Derbyshire, the limited edition book details the history of the Thornhill family's involvement in lead-mining between the 17th and 19th centuries, and their enthusiastic investment of venture capital into pioneering technical solutions for de-watering the orefield, and in many cases producing huge returns on their investments. They co-funded some of the longest, deepest and most famous soughs in Derbyshire, and installed multiple Newcomen water-pumping engines deep underground in the pursuit of more lead. 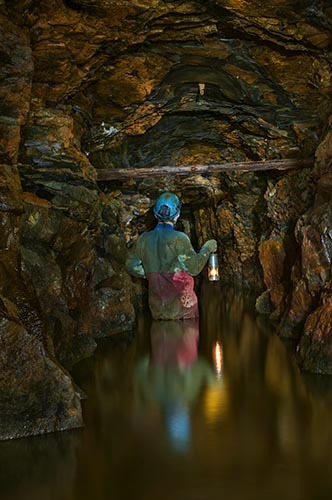 Many of the sites photographed in the book are rarely visited and/or poorly documented, and include Oden Mine, Blue John Caverns/Waterhull Mine, Mandale Mine, Yatestoop Sough and Drake Mine in Winster. This luxury lead-grey clothbound edition of only 300 copies is full-colour throughout, 160 pages, 25cm X 21cm in size and features a large number of underground photographs taken by myself and produced especially for the book - I also designed the dust-jacket image. The book has been designed and published by Peter Miles of Hucklow Publishing, and features rare original maps, charts and illustrations from the Stanton Archive and Dr. Rieuwerts' private collection, additional photographs by Paul Deakin and vintage photographs of Millclose Mine and its miners.